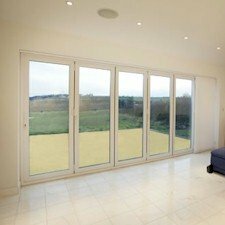 Description: Made-to-measure Five panelled bi-fold folding sliding door. This door is one folding unit, there is no main opening sash. Using 70mm sculptured profile internally beaded, with an A Rating and 5 point locking system Dimensions: The Five panelled folding door will suit open.. Description: Made-to-measure Five panelled bi-fold folding sliding door. This door is four bifold panels plus a fixed door Using 70mm sculptured profile internally beaded, with an A Rating and 5 point locking system Dimensions: The Five panelled folding door will suit openings .. Description:Made-to-measure Five panelled bi-fold folding sliding door. This door is a three - two split bifold panel door Using 70mm sculptured profile internally beaded, with an A Rating and 5 point locking system Dimensions: The Five panelled folding door will suit o..